Learn the most powerful Destruction spells Skyrim has to offer. Talk to Faralda, who will give you a book. Visit Windward Ruins, activate the pedestal and cast a fire spell on it. Visit North Skybound Watch, same as before, but casting a frost spell. Visit Four Skull Lookout, same as before, but casting a shock spell. Learn the spell contained within the book. A simple place, a shield from draft. So fierce the sea will boil. Nirn's hoary Throat does scrape the sky. And gild this stand with frost. On mountains sits a humble crown. To shake these snowcaps down. 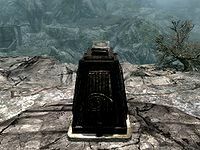 This final clue points to Four Skull Lookout, another small barrow near Karthwasten and north of Karthspire in The Reach (east and slightly north of Markarth, directly East across the gorge from The Lover Stone). The pedestal is on the other side of the stone building. Casting any lightning spell at the book or pedestal completes it. Efforts to impress fall short. I'll merely use a blade. My pupil you would be, or more? Though this tome I gladly claim. Shining gem from feeble mind. Now die, and curse my name! Reading the completed book grants you the Fire Storm spell. Once you have completed this quest, Faralda will sell spell tomes for the other two Master-level Destruction spells (Lightning Storm and Blizzard). As dragon shouts are technically spells, they can be used to activate the pedestals. The quest only requires a skill level of 90, but Faralda's opening dialogue has a requirement of level 100, which is inconsistent with the quest and the other master level quests. There is a known bug in the lightning spell part of the quest where the book will not appear after casting a lightning spell and activating the pedestal. To fix any bugs, cast the lowest available spell at the book, especially for lightning (Sparks). The bug may actually be with the frost spell not activating properly, even if it appears to have done (the stage being marked as completed in the journal). If you return to North Skybound Watch and redo the frost spell altar, and then return to Four Skull Lookout, it should work. The completed quest journal entry may not appear as the latest finished quest but will be in order the moment you receive the book from Faralda. ? There is a bug in the french version of the game. After you use the frost spell, the third page lead you to the "eastern river waters" instead of "western river waters". ? 10 I've asked Faralda about additional training in Destruction. She gave me a book called "Power of the Elements" and hinted that it could lead me to new, powerful spells. I should examine the book to see what I can learn. 200 Finishes quest I have followed the clues in Power of the Elements, allowing me to finish the book. On the PC, it is possible to use the console to advance through the quest by entering setstage MGRitual01 stage, where stage is the number of the stage you wish to complete. It is not possible to un-complete (i.e. go back) quest stages, but it is possible to clear all stages of the quest using resetquest MGRitual01. This page was last modified on 14 May 2018, at 03:04.